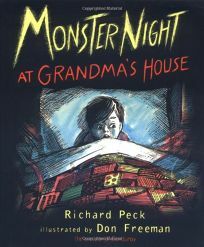 Richard Peck's only picture book, Monster Night at Grandma's House (1977), illus. by Don Freeman, appears here with an author's note recounting the volume's genesis. This tale of a boy's fearful night at Grandma's house unfolds through a lengthy text perhaps best appreciated by die-hard Peck fans. Freeman's two-color scratchboard artwork in India ink and watercolor adds to the period feel.